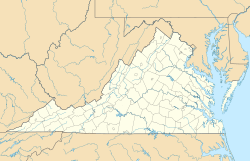 Emory is a census-designated place (CDP) in Washington County, Virginia, United States. The population was 1,251 at the 2010 census. It is part of the Kingsport–Bristol (TN)–Bristol (VA) Metropolitan Statistical Area, which is a component of the Johnson City–Kingsport–Bristol, TN-VA Combined Statistical Area – commonly known as the "Tri-Cities" region. The Emory post office was established in 1847. The community is named for and is the location of Emory and Henry College. ^ "Washington County". Jim Forte Postal History. Archived from the original on 6 October 2014. Retrieved 30 September 2014. This Washington County, Virginia state location article is a stub. You can help Wikipedia by expanding it. This page was last edited on 21 August 2018, at 20:23 (UTC).